Cut the stems from the mushrooms and place in a large measuring cup. Cut the caps into 1/2-inch pieces. Add enough of the cap pieces to the stems to measure 2 cups total. Reserve the remaining chopped caps for the vegetables. Heat 1 tablespoon of canola oil in a heavy, large saucepan over medium-high heat. Add the mushroom stems and caps and sauté until beginning to brown, about 4 minutes. Add the shallots and 1 tablespoon slivered ginger and cook until fragrant, stirring frequently, about 2 minutes. Add the sherry and bring to a boil, scraping up browned bits. Add 3 cups of water and bring to a boil. Reduce the heat and simmer uncovered until reduced to 2 cups, about 15 minutes, pressing on solids to extract liquid. Boil until reduced to 1/4 cup, about 8 minutes. Transfer the broth to a small bowl. 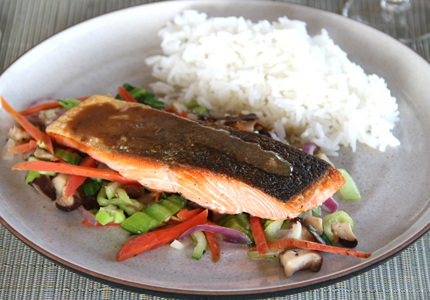 Whisk the miso, vinegar and 1/4 cup of the canola oil into the sauce. Cook the bok choy in a medium saucepan of boiling salted water 30 seconds to soften slightly. Drain well. Squeeze lightly to remove excess liquid. Season the salmon with salt and pepper. Heat 2 tablespoons of the canola oil in a large, nonstick skillet over medium-high heat until almost smoking. Arrange the salmon skin side down in the pan. Cook until the skin is golden and crisp, pressing occasionally with a spatula to flatten, about 7 minutes. Turn the fish over and cook until it is springy to the touch and just opaque in the center when cut into with a small, sharp knife, about 1 minute. Meanwhile, heat the remaining 2 tablespoons of canola oil and the sesame oil in another large skillet over medium-high heat. Add the reserved chopped mushrooms and toss to coat with oil. Sprinkle with salt and pepper, and sauté until beginning to soften, about 3 minutes. Add the carrots, sliced onion, minced ginger and garlic and stir-fry for 2 minutes. Add the bok choy and stir-fry until the vegetables are just crisp-tender, about 1 minute longer. Season to taste with salt and pepper. Divide the vegetables among 4 warmed plates. Top with the salmon, skin side up. Drizzle the sauce over and around the fish and serve. To make matchstick-size slivers of ginger or carrot, cut into thin diagonal slices, fan out the slices on a work surface, and then cut into slivers. Red miso, an intense paste made from fermented soy beans and rice, can be found in the refrigerated Asian section of the grocery store or in Japanese markets. Previous Previous post: October is National Seafood Month!